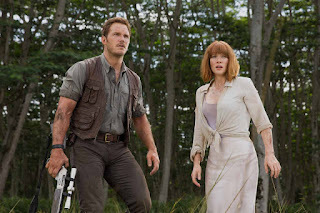 When did we stop demanding that our summer blockbusters have real plots? Have I become the cranky old lady in a rocking chair, complaining bitterly about "the good old days?" Sure, summer blockbusters have always been known for emphasizing action over substance, but when did we reach Transformers 4-levels of CGI completely replacing a script writer? 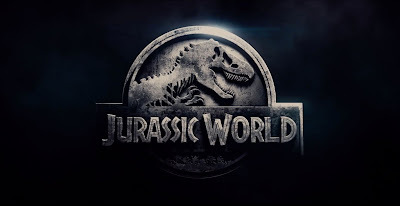 The overall premise is believable--that is, if we as a society had already found a way to bring back dinosaurs, that someone would capitalize on its marketing appeal and create an interactive theme park of sorts. You know, the same plot as the first movie. I can even get on board with the fact that eventually, some dumbass would start mixing genes to create some sort of super dinosaur that could basically kill everyone. But outside of those two points? Everything else is a stretch. And I do mean everything else. Why is there no governmental regulation or oversight of this very obvious potentially dangerous park? Why is the design of the headquarters copied from watching Apollo 13 or really any other NASA-themed movie? Do the writers understand they're writing about a theme park/zoo? Why would a theme park ever allow visitors to actually drive their own bubbles through open fields of dinosaurs? Is everyone operating on the "honor system?" Did the writer of Fifty Shades of Grey write the banter between Pratt and Howard? Is this movie for real? Add to that, Vincent D'Onofrio's appearance as the most unintentionally ridiculous villain since Hugh Jackman in Chappie and this movie was practically a comedy. An action comedy, of course. Maybe I missed something, watching it at home on DVD instead of in a big dark theater, but this movie was lacking the suspense and terror the first movie brought. Instead, you just knew the dinosaur was going to be waiting around the corner or above someone's head every time the camera did a slow pan. Granted, I don't watch a lot of suspense movies, but there has to be other methods of drawing that same sensation. It was as if this movie copied every technique from the first movie (with the exception of more updated CGI), except badly. Which leaves you with only CGI and action--both of which are good. It's hard to hate any action sequence, really, outside of the ending of 22 Jump Street. So that's something, I guess. Final word: It plays like the 4th movie in a series that never needed a sequel. Which it is.